Sores on your head or scalp can hurt and may be embarrassing. Unless you're skilled at taking back-of-the-head selfies, they also can be hard to see. What causes these lumps and bumps that can make things like brushing your hair painful? It can be anything from minor local infections to signs of a health condition that can affect your whole body. Your head sores last more than a few days or won't heal. You have a lot of sores or they keep coming back. You've noticed any changes in the shape, size, or color of bumps or lumps on your scalp. Contact dermatitis happens when your skin reacts badly to something that touches it. You might get it on your scalp from shampoos or other hair products. Or you could get it from a poison oak leaf brushing against your head. It causes patches of red, itchy, scaly skin. When it's severe, it also can lead to crusty, oozing sores. If you stay away from the thing that triggered the rash, it should go away in 2 to 4 weeks. So if symptoms start just after you try a new hair product, switch to a different brand to see if that helps. Your doctor also can do skin tests to help figure out what's causing the problem. These smooth, firm lumps can develop in your hair follicles. The follicles anchor each hair to your scalp. Cysts grow slowly and usually don't hurt, but sometimes they can get swollen and painful and may ooze a thick fluid with a bad smell. Cysts are harmless and usually go away on their own. But if a cyst on your scalp bothers you, see your doctor. She may be able to treat it with steroid shots to ease inflammation, drain it, or remove it. If bacteria, a virus, or fungus gets into a hair follicle, you can get this kind of infection. It may look and feel like a pimple, a painful red bump with or without a white head. These sores can be crusty and scabby, too. The sore typically clears up without treatment. But keep the area clean and use a warm compress to make it feel better. If it lasts more than a few days, see your doctor. You might need an antibiotic cream or other treatment, depending on what's causing it. These tiny bugs don't usually cause head sores themselves. But they can make your scalp very itchy. And scratching can lead to painful and even infected sores. If you have lice, you may notice their eggs (about the size of pinhead) attached firmly to shafts of hair. You also may see the bugs, which are about the size of a sesame seed. Special over-the-counter shampoos may be enough to get rid of them. Talk to your doctor about other treatments if shampoos don't do the trick. Ringworm is not a real worm. It's a common infection caused by a fungus. Ringworm goes by different names depending on where it is on your body. It's known as jock itch and athlete's foot. When it's on your head, it's called tinea capitis. It causes patches of itchy skin and hair loss that may get worse over time. You also may get a painful, pus-filled sore called a kerion on your scalp. Scalp ringworm is most common in kids. But it also can affect adults. The best treatment is usually prescription medicine you take by mouth. Ringworm creams and powders don't tend to work on the scalp. This condition can cause patches of red, flaky skin on your scalp. Since it's often itchy, scratching can cause bleeding and scabbing. Psoriasis affects your whole body. So it's also likely to show up on areas besides your scalp such as your elbows and knees. To treat scalp psoriasis, work with your doctor. Special shampoos with coal tar or salicylic acid can help control it. But you also may need medicines, light therapy, or other treatments. You probably know about the mildest form of this type of eczema -- dandruff. But it also can cause scaly, itchy patches on your scalp that can ooze and scab over. Symptoms tend to come and go and may be worse in winter. There's no cure for it. But some things like special shampoos, medicines, and creams can help with the symptoms. 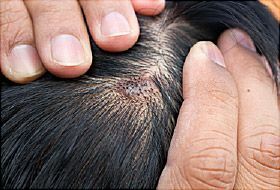 They're not as common, but lots of other conditions can cause head and scalp sores. They include acne, viruses like chickenpox, and a group of rare autoimmune diseases called pemphigus, which happen when your immune system attacks healthy cells. Mayo Clinic: "Contact dermatitis," "Folliculitis," "Ringworm (Scalp)." UpToDate: "Approach to the patient with a scalp disorder," "Overview of benign lesions of the skin," "Seborrheic dermatitis in adolescents and adults." Cleveland Clinic: "Sebaceous Cysts," "Do You Have an Itchy Scalp? 5 Common Problems and Fixes." American Academy of Dermatology: "Head Lice: Diagnosis and Treatment," "Scalp Psoriasis: Signs and Symptoms," "Scalp Psoriasis: Diagnosis and Treatment," "Seborrheic Dermatitis: Diagnosis and Treatment." CDC: "Head Lice: Frequently Asked Questions (FAQs)," "Treatment for Ringworm." American Osteopathic College of Dermatology: "Fungus Infections." National Institute of Arthritis and Musculoskeletal and Skin Diseases (NIAMS): "What Is Pemphigus?"